By Kate Denereaz, for the AMAR International Charitable Foundation. Work is a huge part of our lives. It provides security, meaning and a sense of belonging. It’s part of who we are. Many AMAR staff, like the people they serve, have been displaced by war and violence. Working for AMAR provides structure and a semblance of normality. Click here to hear their stories. Posted in AMAR Foundation, AMAR International Charitable Foundation, featured, Healthcare, International Women’s Day, mn, United Kingdom, Women. The Kurdistan Democratic Party (KDP) and Patriotic Union of Kurdistan (PUK) have reportedly signed a four-year political agreement which includes measures to speed up the formation of the new Kurdistan Regional Government (KRG). According to a report from Rudaw, KDP deputy president Nechirvan Barzani and the PUK’s acting leader Kosrat Rasul Ali signed the cooperation deal in Erbil on Monday afternoon. It adds that the deal was welcomed by the Change Movement (Gorran), which struck its own deal with the KDP on 16th February. Posted in erbil, featured, Gorran, KRG, Kurdistan Democratic Party (KDP), mn, Patriotic Union of Kurdistan (PUK), Politics, Security. The government of Japan has donated US$3.4 million to provide lifesaving health and nutrition assistance for vulnerable children in conflict affected areas in Iraq. Approximately 4.2 million people have returned to their homes after fleeing the violence that erupted in 2014, however many find their homes and communities have been reduced to rubbles and essential health services overstretched. “Across all conflict affected governorates, hospitals have been destroyed and those that are functioning are overwhelmed and struggling to meet health and nutrition needs, placing the lives of the most vulnerable children at risk of deadly diseases, including polio and measles,” said Peter Hawkins, UNICEF Representative to Iraq. “Japan has recently decided on a new assistance package for Iraq amounting to 63 million US dollars, including this project as contribution in health and nutrition sectors. With this package, the total amount of Japan’s assistance to the people affected by the crisis in Iraq reaches 500 million US Dollars,” said H.E. Mr. Naofumi Hashimoto, Ambassador of Japan to the Republic of Iraq said. UNICEF is grateful to the Government of Japan in their unwavering support to vulnerable children and families in Iraq. Since 2015 UNICEF Iraq has partnered with Government of Japan to support the needs of children caught in cycles of violence. The latest funding of US$.3.4 million will compliment Japan and UNICEF’s investment for Iraqi children by building the capacity of health workers, strengthening health systems in conflict affected governorates as well as providing immunization and nutrition services to nearly 1 million children and breastfeeding mothers in areas of returns as well as in the camps for displaced people. Posted in Children, featured, Healthcare, Japan, mn, UNICEF, United Nations Population Fund (UNFPA). By Alexander Southworth, Iraq Britain Business Council (IBBC). “Education is the most powerful weapon which you can use to change the world”. In a country which has seen its fair share of weapon misuse over the last few decades Mandela’s quote could not be more relevant in the climate of present-day Iraq. With a beleaguered state education system and struggling infrastructure, there exists a community within the Tech Sector that is trying to navigate these challenges and promote education of Iraqi youths through the cultivation of digital skills that will help them reach their goals and find meaningful employment. In the IBBC’s Tech Series: Exploring Tech in Iraq, we speak to some of the innovators and founders of tech organisations making a difference in Iraq. One such organisation, HackaSuly, is an initiative that aims to promote technology in Sulaimani, Kurdistan and wider Iraq through tech events, hackathons, meetups and to create a network of tech enthusiasts. We spoke to one of the founders, Hero Mohammed, to find out more about HackaSuly’s events, how they are empowering young Iraqis, the inspiration behind the founding of the organisation and any advice she has to aspiring tech entrepreneurs. Growing up in Sulaimani, Iraqi Kurdistan, Hero describes her desire to participate in coding challenges and tech events but due to a near complete lack of opportunities, this simply was not possible. In 2015, she helped organise HackaErbil, the first Hackathon in Iraq, which would inspire her to embark on a journey to help others in the community to have the opportunities her peers did not have as college students. Building on the success of that first event, Hero started by organising the first hackathon in Sulaimani with the help of some friends. So how exactly does HackaSuly help young coders through its events? HackaSuly is trying to help young coders to develop their skills and match them with the existing tech market demands. In the meanwhile, they are encouraged to update themselves with cutting-edge technologies and tools. Until now, they have had three different types of events. Meet and code (Co-founded with Razhan Hameed): regular weekly coding meetups for coders and people who are interested in coding to come together, collaborate and share their knowledge and skills. 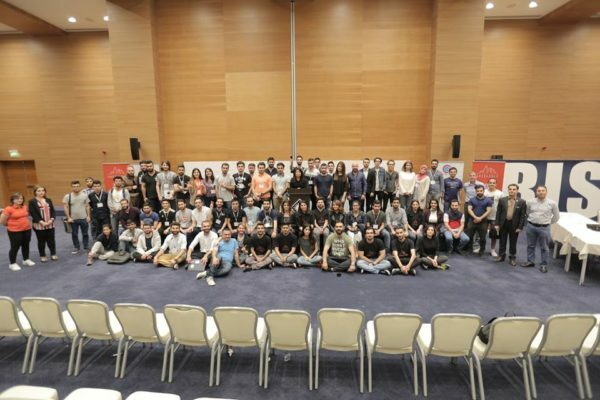 HackaSuly Hackathon (co-organised with Snur Hamid): an annual hackathon that brings together developers, designers and entrepreneurs to come up with ideas that have a technological implementation, form teams and develop their prototypes over a weekend. Suli Tech Festival (Co-founded and co-organised with Razhan Hameed in collaboration with five one labs): a day-long tech celebration in Sulaimani. The Festival brought together young innovators and members of the local tech community with leaders and companies in the industry. The goal was to help promote technology, generate more interest in the field, and expand knowledge of career opportunities (from the participant’s side) and potential hires (from the business’ side) in the tech industry in Sulaimani. The Festival contained a number of exciting events over the course of the day, including: a welcome speech by the Deputy Prime Minister of Kurdistan Regional Government, a Coding Challenge, an Intro Workshop to Web Development, a Tech Career Fair and Project Presentations. While events of this nature may be common in more tech-developed countries, their establishment in Iraq brings many serious challenges. Hero describes how their ideas and events are new to the society in general and the biggest challenge has being delivering their message. Explaining the events and ideas especially when seeking funds and support have been challenging. When they first started with the HackaSuly hackathon, there was significant difficultly making people within the tech industry, even professionals, understand what a hackathon is. Support has been key to growing the operation, Hero states great support has been forthcoming from local and international NGOs and private sector companies, especially those that are operating within the Iraqi tech industry, many as part of their Social Responsibility programs. More support is necessary to keep momentum growing, especially government contributions. Inspired by her strong love of coding and tech, Hero is one of the inspiring young innovators that are driving tech literacy and interest in a new generation of Iraqis. By creating a community of tech enthusiasts in Iraq and Iraqi Kurdistan, HackaSuly is empowering young people to believe in their abilities, learn new skills and create for themselves tech start-ups in Iraq’s fast growing tech Sector. As Hero states: Access to new technologies can have many benefits for any developing countries. One such benefit is its impact on reducing the costs of production. Other ways technology is helping developing countries is by boosting economies through innovation, SMBs and advanced communication. IBBC is holding a Tech Conference in Iraq in early 2019, where we aim to bring together the key innovators transforming the digital landscape in the country, explore solutions to better governance and industry reforms using technology and give a platform to young Iraqi entrepreneurs breaking the mould. For more information, and to get involved, please email: London@webuildiraq.org or visit: https://www.iraqbritainbusiness.org/event/tech-conference-in-baghdad. Posted in baghdad, Business, Citi, Citigroup, Entrepreneurship, erbil, featured, HackaSuly, Iraq Britain Business Council (IBBC), Iraq Education and Training News, Iraq Industry & Trade News, Kurdistan News, mn, start-ups, Sulaimaniyah, United Kingdom. Iraq’s Ministry of Oil has announced interim oil exports for February of 101,387,615 barrels, giving an average for the month of 3.621 million barrels per day (bpd), down from the 3.649 bpd exported in January. These exports from the oilfields in central and southern Iraq amounted to 99,120,006 barrels, while exports from Kirkuk amounted to 1,753,373 barrels, and from Qayara 514,236 barrels. Revenues for the month were $6.168 billion at an average price of $60.834 per barrel. January export figures can be found here. Posted in Business, Ceyhan, featured, Iraq Oil & Gas News, Iraq Oil Exports News, Kirkuk Ceyhan pipeline, Kirkuk Oilfields, mn, North Oil Company (NOC), Turkey. Posted in Business, featured, GardaWorld, mn, Security, Weekly Security Update. Zain Iraq and Ericsson have announced an Internet of Things (IoT) competition for university students in Iraq. The first-of-its-kind competition will run for six weeks during which the students are invited to present use cases to address the possibilities of 5G-IoT and industry digitalization and ultimately capture their full business potential. The competition is supported by the Communication and Media Commission (CMC) in Iraq as part of its initiative (Du3M 2025) with an aim to engage millennials from top Iraqi universities in identifying innovations that will transform the way they live, work and learn. Around 29 billion connected devices are forecast by 2022, of which around 18 billion will be related to IoT. Connected IoT devices include connected cars, machines, meters, sensors, point-of-sales terminals, consumer electronics and wearables. Between 2016 and 2022, IoT devices are expected to increase at a compound annual growth rate (CAGR) of 21%, driven by new use cases. The collaboration between Zain Iraq, Ericsson and CMC is a continuation of the series of initiatives to help turn the communications sector in the Middle East and Africa into one of the most dynamic and vibrant in the world. Posted in Business, Commission, Communications and Media Commission (CMC), Ericsson, featured, Internet of Things (IoT), Iraqi Communications News, mn, Sweden, Zain. The Government of Italy has contributed an additional USD 2.7 million (EUR 2.4 million) to UNDP’s Funding Facility for Stabilization (FFS) supporting communities affected by the Islamic State of Iraq and the Levant (ISIL), taking its total contribution to USD 12.9 million. “It’s very heartening to see countries like Italy acknowledging this and reaffirming their commitment to helping communities across Iraq rebuild their lives. We are grateful for this support and we look forward to continue serving the people of Iraq,” adds Mr Noto. “Italy maintains its commitment in supporting Iraq’s stabilization efforts to provide basic services to the newly liberated areas,” says Italian Ambassador to Iraq, Mr. Bruno Pasquino. “This fourth contribution to the FFS is a testimony of the full engagement of Italy for the people of Iraq, as a qualified partner in various fields, from the provision of services to the rehabilitation of infrastructure and to the capacity-building activity in favour of the Iraqi Security Forces,” adds Ambassador Pasquino. The Facility currently has more than 3,100 projects underway in 31 liberated cities and districts, helping local authorities to quickly rehabilitate essential infrastructure. More than 95 percent of all stabilization projects are done by the local private sector employing local labour. Posted in Citi, Citigroup, featured, Funding Facility for Stabilization (FFS), Iraq Public Works News, Italy, mn.